Are you feeling overwhelmed with the new LinkedIn user interface (UI)? You may be trying to figure out how to do or access some of the things you are used to on LinkedIn. In this article, I will outline the changes to the new UI so you can become accustomed to what’s changed, what’s lost and what’s still available. 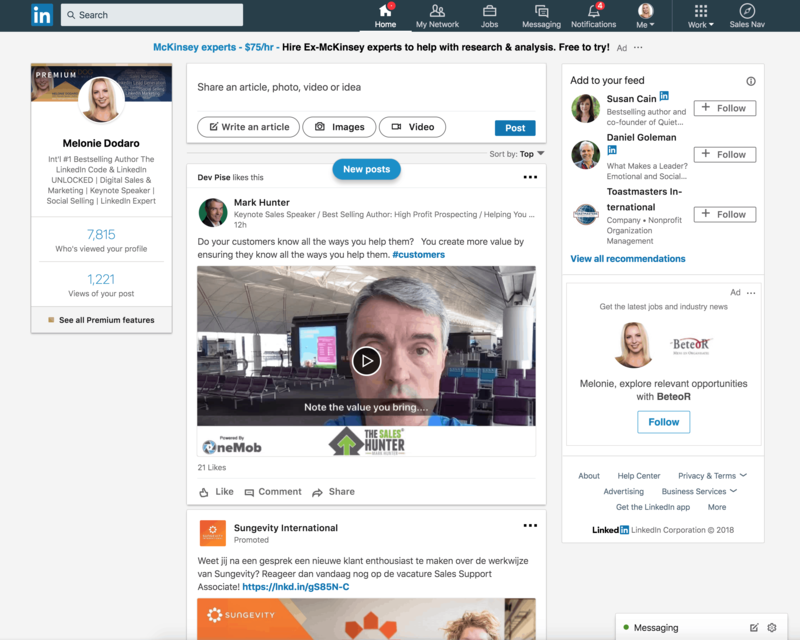 While it certainly looks like we lost more than we gained with LinkedIn’s UI makeover, there is still plenty of functionality to help professionals, sales people and marketers to find, connect and build relationships with their ideal clients. If you are comfortable with the user interface and are looking for help to modify or update your lead generation or social selling strategy, keep checking back as I will be covering this soon in a future article. Below you will find my complete breakdown of the new LinkedIn user interface. While the new home page contains many of the same elements, it has a clean, new (almost Facebook) look. The look of both free and paid accounts is similar with the only difference being the Premium identification at the top of the box on the left. The box located to the left side of the page is a small version of your profile and cover photo with your name and headline. Below this are two stats. The first is how many people have viewed your profile and the second is how many people have viewed your latest post or article (or your number of connections if you have not recently posted). At the top of the page in the center is the Status Update box. As with the old UI, you can post a status update by clicking in the box and typing your update or adding an image or video. To post a Publisher article, click on Write an article. If you click in the box, LinkedIn tells you that you can tag other LinkedIn members by using @ to mention them. While you can change who you share your posts with (Public, Public + Twitter, Connections), I would recommend you leave this set to Public. You can also choose to not allow comments, but I would NOT recommend this as the point is to engage in conversation. With the new LinkedIn user interface you can access the Who’s viewed your profile page by clicking on section of the box located in the top left corner of your homepage. Once on your Who’s Viewed Your Profile page, what you see will be dependent on whether you have a free or Premium account. 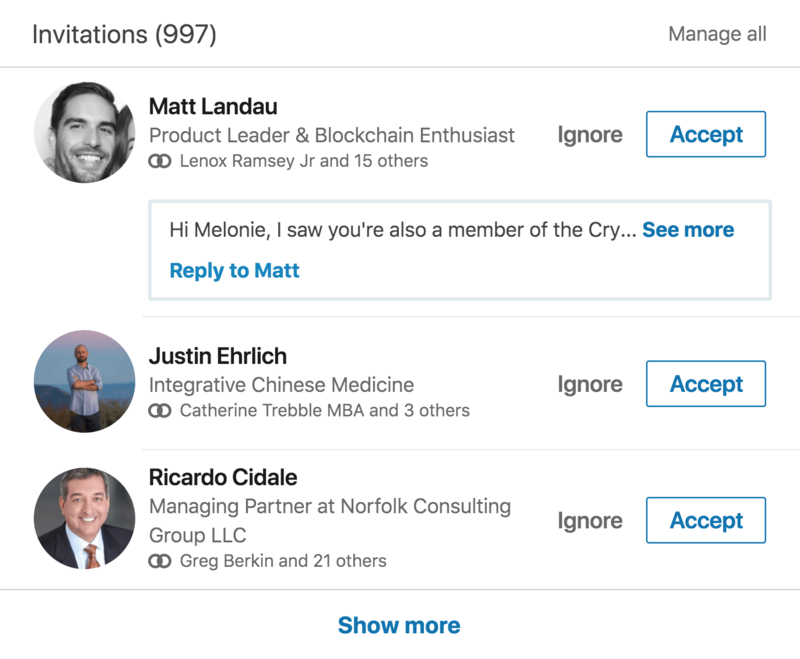 With a Premium account, not only will you see everyone who has viewed your profile in the last 90 days, but LinkedIn also provides you with additional info. To use a filter, simply click on it. With a free account, you are only provided with the last five people to have viewed your profile and none of the filters. You can review all of your activity such as status updates, Publisher posts and any engagement you have with the content of other LinkedIn members. To view your Activity Page, click in the bottom area of the box found in the top left corner of the home page. In the top left corner of the page you will again see your profile box at the top and just below your number of Followers. It is important not to confuse your number of Followers with the number of your Connections. Followers include your 1st degree connections as well as people who have chosen to “Follow” you. Under each heading, you will see the first three of each area, followed by a link you can click to take you to a full, editable list. Under Articles you will find a chronological list of each of the articles you have published. In each article box, you will see the title, cover image, date published and post views (which is also a link to the stats for that article). Click the view link to open up the stats box for the article. While not nearly as detailed as the stats provided in previous versions, in this popup you will find a variety of helpful stats. At the top of the page you will see your number of views, comments, likes and reshares. You can see exactly who has shared your Publisher post by clicking reshares. To see the list of who has commented or liked your article, visit the article where you can see the comments or click on Likes to see a list of who has liked it. LinkedIn will also share random information such as a company that had multiple people view your article, the most common job titles of your viewers, the region most of your viewers come from and how people found your article. In the Post section, you will see a list of all your status updates. In each status update box, you will see the likes and comments it has received and the number of views with a link to the stats. The stats popup is similar to that for your Publisher posts. At the top, you will see the text of the post, and the number of views, comments and likes. Below, LinkedIn will provide you with stats on which companies had the most people view your post, the most common job titles of the viewers and where your viewers most commonly from. The All Activity section shares a chronological timeline of all of your engagement (likes and comments) on other people comments or engagement with your content. The My Network page is where you will find your connection requests and a list of your connections. In the top left corner, you will see the number of 1st degree connections you have. You can see a complete list by clicking on the See all link. On the Connections page, you will see a list of your connections that you can scroll through. If you have hundreds or even thousands of connections this isn’t very handy. There is a search bar where you can search for a specific name or you can search using filters by clicking Search with filters. This will take you to LinkedIn’s current version of Advanced Search where you can drill down using keywords or the filters available. At the top of the middle of the My Network page is where you will find your connection requests under Invitations. I would advise against using the Manage all link at the top as you want to address each request individually. If a list has a personalized message it will be shown below their name and headline. Click the See more link to see the full message. You can then open a window to review their profile as well as click the Reply to Connection link in a new window to send them a follow up message. Below your invitations is a list of people LinkedIn thinks you may know. You can review this list from time to time to look for people to connect with. Rather than simply being a dropdown list, Notifications now has its own page. Here you can see notifications when people engage with you or your content in various ways. You will find a lot of features now buried under Me in the top navigation. The Advertise section is where you go to set up or manage any paid advertising you do on LinkedIn. If you haven’t yet set up an ad account, you will find plenty of information on the different options and benefits. If you do have an ad account, click the Create Ad button located in the top right corner of the page to go to your ad accounts. To access all the materials in the Learning Center you need to either purchase monthly access or you get free access if you have a LinkedIn Sales Navigator account. You can post job opening for your company on the Post a job page. This option takes you to your Groups page. You can easily find a professional to help you on the ProFinder page. Not sure how much some with your qualifications should making in your area? You can look this up on LinkedIn’s Salary page. This takes you to SlideShare, where you can login or create a new account if you don’t already have one. Tucked at the bottom of the dropdown menu, below their paid solutions is the Create a Company Page option. Many things have changed with LinkedIn’s Advanced Search, so I will be creating a separate article in order to give you a complete look at the modified search and what that that will mean for you. The new LinkedIn user interface certainly has a much cleaner design. With a few exceptions, it is far more intuitive and user friendly and more closely resembles the mobile experience. In terms of usability and features, LinkedIn has hit its free users hard with the loss of features in the Advanced Search and tools such as Notes & Tags. This will have huge effect on those using LinkedIn for lead generation and not paying for Sales Navigator. Check out the articles I have created that dive into these changes including an in-depth look at the Sales Navigator Advanced Search and differences using free v.s. paid LinkedIn memberships. Is there some aspect of LinkedIn’s changes or lead generation using the new LinkedIn user interface that you would like me to cover? Send me a message here.